The movie moves between the virtual reality word and the real world, and during the virtual reality scenes, there is a lot of action. You do feel like you are watching from inside a video game – car chases that turn into monster chases turn into other special effects. The 3D Sensory part was not too bad – there were only a few moments were it felt like something was coming at us; enough to be fun but not over the top. There were a few scary parts – characters dancing with mummies that were pretty detailed, an entire scene that takes place in “The Shining,” and plenty frightening, and lots of fights between the good guys and the bad guys, in a very over-the-top video game way. Our Asperger’s member that attended did okay with the sounds and visuals except for the “Shining” bits, it was pretty intense and he chose to not watch those parts. Overall, sensory-sensitive individuals may struggle on this one without some tools/accommodations, especially if 10 and under. 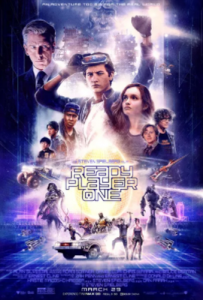 The Sensory -Friendly Ready Player One Movie night is April 10th, 2018, at participating AMC theaters – to see closest theater near you click on AMC’s site.